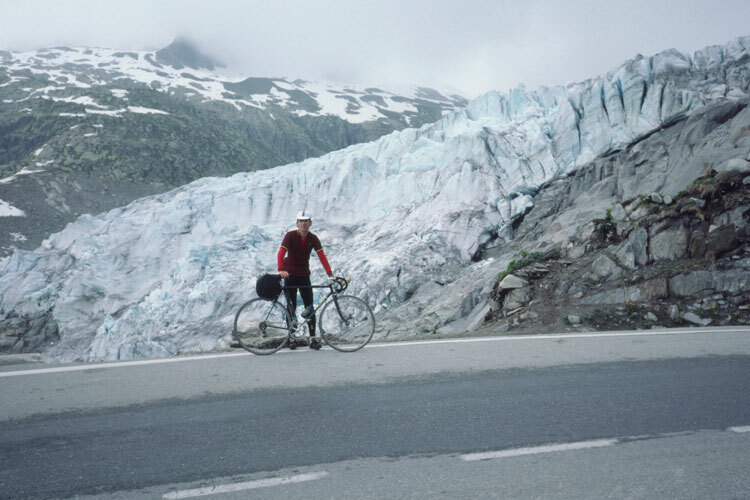 After my first ride through the Alps the previous year, I had the opportunity to go with Jobst Brandt, who had been riding in Europe since 1959. We would brave fallout from the Chernobyl nuclear power plant meltdown in Russia. A plume of radioactive dust blew over the Alps while we were there. Here’s my glowing report. We packed our bikes in clear plastic bags, a technique Jobst perfected and probably the safest way to ship a bike. It requires removing the cranks, but these are carry-on items. Our destination was Zurich. 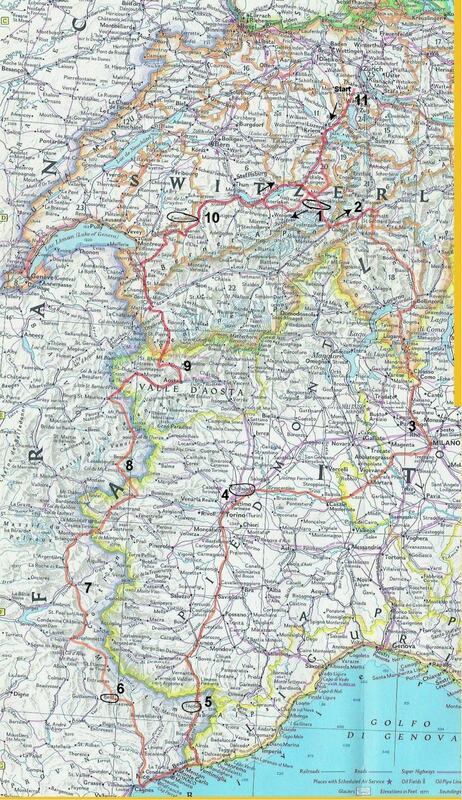 Jobst has friends in Affoltern — the Dierauers — about 30 kilometers by rail southwest of Zurich. We arrived at 3 p.m., with plenty of time for a ride. Under cloudy skies and light drizzle, we rode east into the hills to Albis Pass and then Uetliberg, where there’s a great view of Zurich. 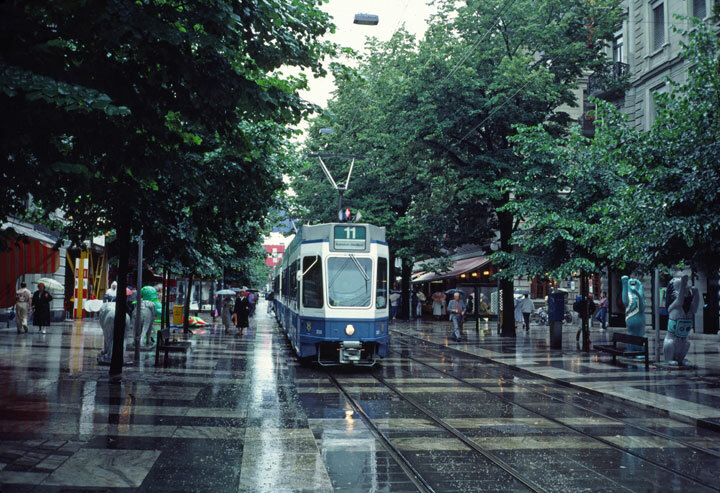 Zurich on the famed Bahnhofstrasse near the main rail station. Jobst, who knows his birds, identified a wagtail, green finch, rose-colored finch, heron, gold finches, and common swifts. We passed a lake with a unique system for protecting frogs. During mating season when frogs visit the lake, they often wind up under wheels of passing cars. Someone put up a rabbit/frog wire fence along the road and added a pipe beneath the road for the frogs. 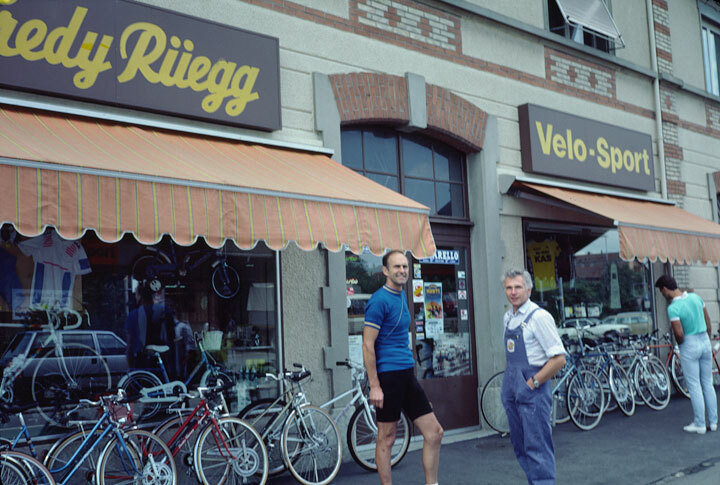 In the morning we went to the bike shop of Fredy Ruëgg (1934-2010) to buy Jobst some bike shoes, he having forgotten his for the trip. 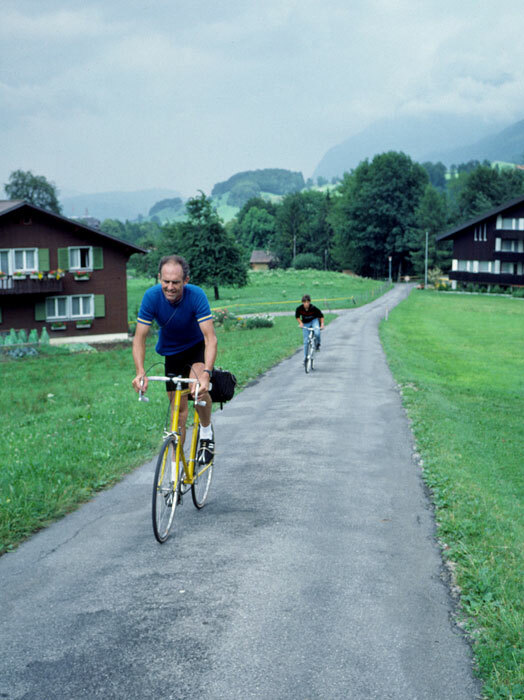 Freddy won the Tour of Switzerland in 1960. His shop in downtown Affoltern near the train station has upstairs living quarters. Jobst and Freddy have known one another for years, so it was a chance for them to sit down to tea and chat. Freddy still rides and looks fit and trim. Jobst with Freddy Ruegg in Affoltern. We left town about 10:30 a.m., following roads along the Reuss River to reach Luzern at 12 p.m. We stopped to visit Mrs. Dierauer Sr., who lives above the Armory at the city wall. 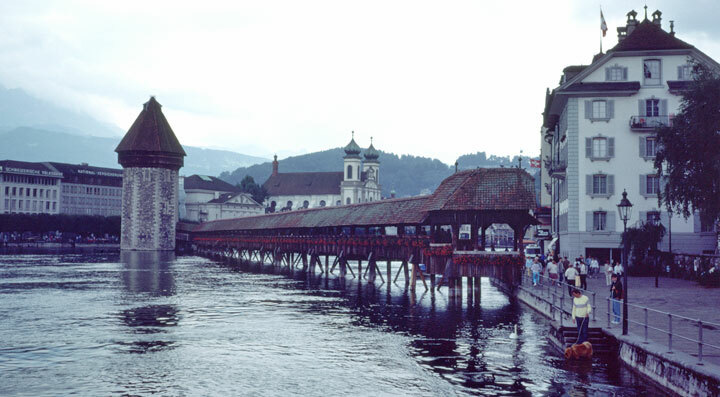 After a friendly visit we headed to see the famed wooden Reuss Bridge in downtown Luzern. 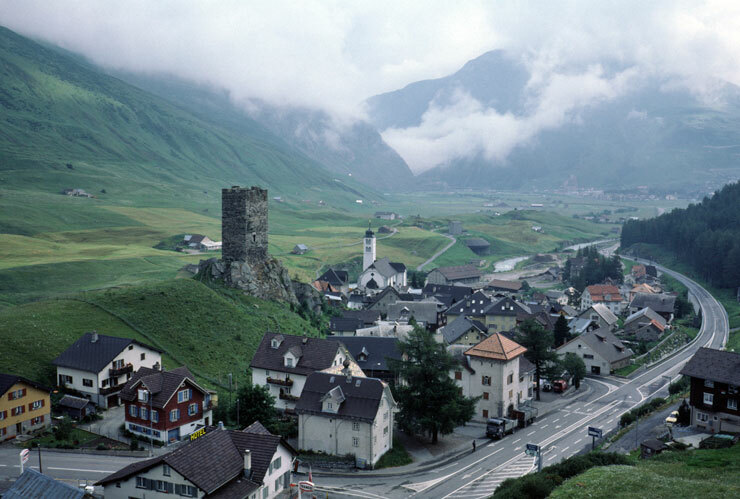 Jobst pointed out trout swimming in the Reuss River, a marvelous sight in the heart of a city. 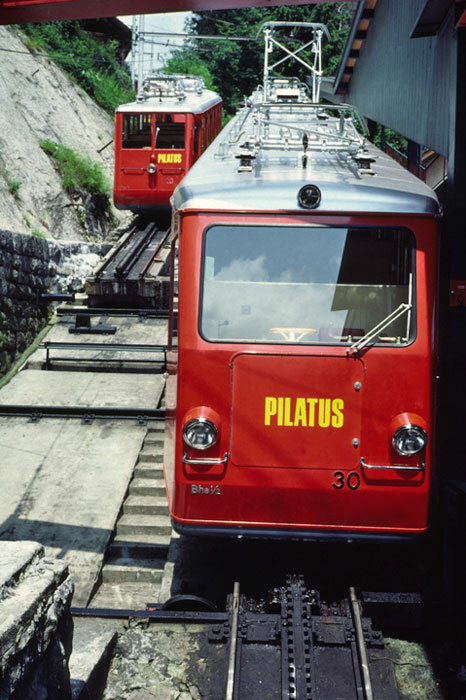 After taking photos, we rode south to Sarnen, stopping to see the world’s steepest cog wheel train at the foot of the Pilatus in Alpnachstadt. From Sarnen we turned left and climbed a permit-only road to the town of Melchtal. The narrow road followed the Melch River. From Melchtal the road climbed. Under cloudy skies we passed lush green valleys and had views of 2000-meter mountains all around us. The road became one-way in the final few kilometers to Frut (1936 m), a ski area and summer resort. A short distance farther, there’s a youth hostel next to Melch Lake (Melchsee), then up to Tannen Lake (Tannensee), the end of the road. 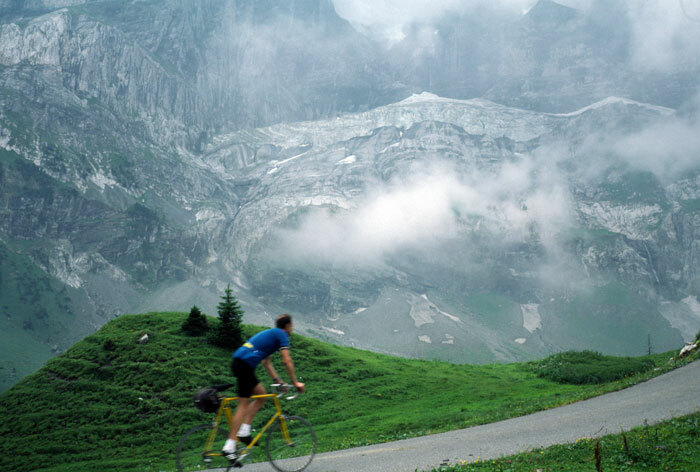 I followed Jobst down the Engsteln (Taanen) hiking trail – a typical Jobst ride – to another permit-only road that connects at Innertkirchen, only five kilometers south of Meiringen. 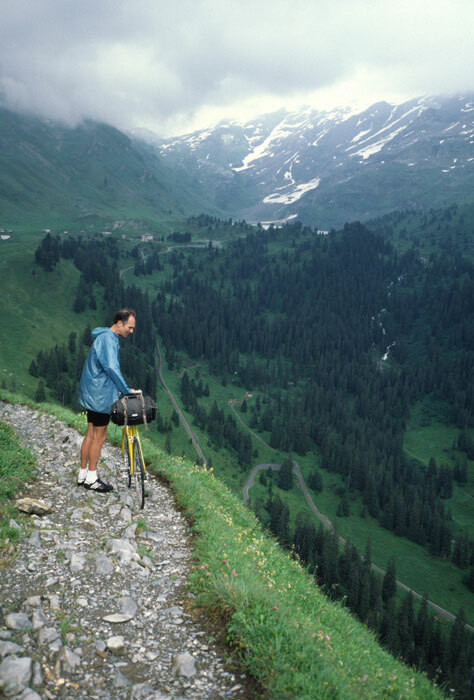 Here in the heart of the Alps on a narrow, rocky trail with a death-defying drop to one side, Jobst showed his Evil Knievel ways and began riding. 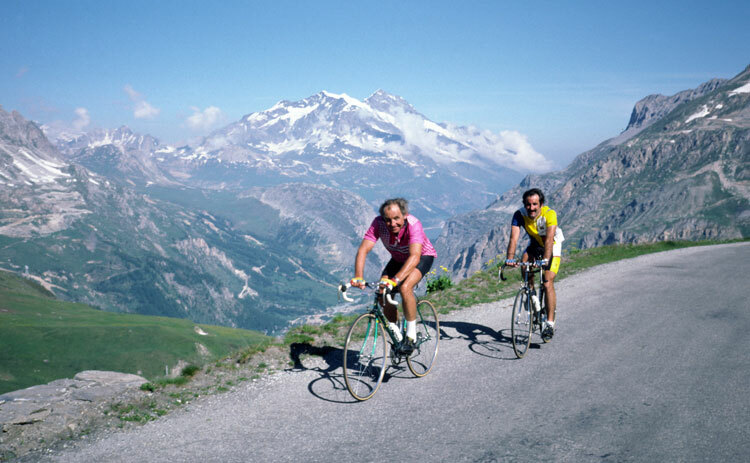 Much to his chagrin, he flatted on a sharp rock, but on previous tours with Peter Johnson, they both rode the trail with aplomb. I walked. As Jobst repaired his flat and replaced a sliced tire, I took photos. We continued on our way, passing hikers toward the bottom of the trail where it meets the paved road. We stopped again to marvel at the hillside where dozens of small waterfalls gushed out of a rocky hill. Sheep blocked the road at one point on Schwarzental Road, slowing us to a crawl as we picked our way through the bleating flock. It was my turn to flat. We left the hotel at 8:30 a.m. under cloudy skies (missed seeing the Eiger), climbing to Schwarzwaldalp on the permit-only road used by the Grindelwald bus company. We stopped for the obligatory photo at the glacier, listening for falling chunks of ice. After the photo, we climbed some more and then descended on the narrow road to Grindelwald, dismounting for a tour bus coming up the road. We headed down to Interlaken under increasingly cloudy skies, stopping for a bite to eat. By 10:45 we were on our way up the Grimsel Pass (2165 m, 7103 f) heading into rain. On a clear day from the summit you can see the major mountain ranges of the Alps, and the Aare River spilling down the Haslital Valley toward Meiringen, where meringue was invented. Today we saw about 100 feet. Bicyclists went by heading down, one rider dragging his foot on the road for a third brake. One diversion took us under a rock overhang and cobblestone roadway from days gone by. Midway in the climb we passed a giant granite edifice of a man with jackhammer creating another one of Switzerland’s many public works projects. The pass, as beautiful as it is, probably has more carved up granite slopes than anywhere in the world — for water works, electric works, and roads. 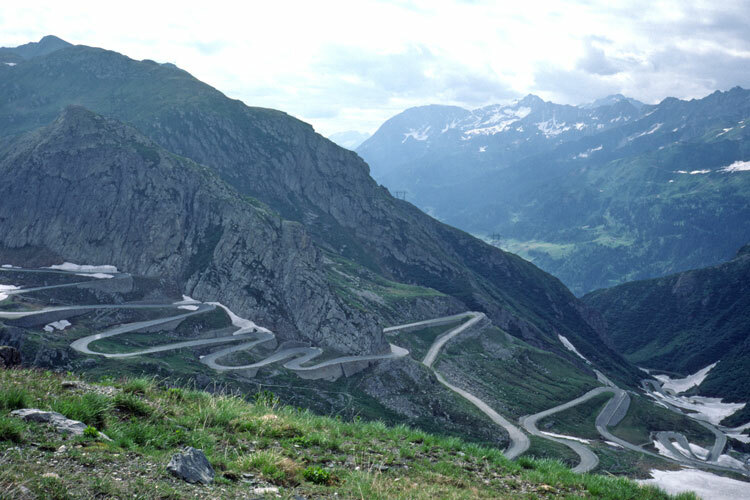 Tunnel bypass road on Grimsel Pass. At the summit we warmed ourselves in a restaurant before descending to Gletsch (759 m, 2490 f), a treeless town with a train station in the heavily glaciated, gravel-rich Goms Valley. Unfortunately, I left my hat and gloves at the hotel, so my hands froze on the wet, windy, cold descent. In Gletsch we had another snack, and I decided to use my socks as gloves. Rhone Glacier on Furka Pass. The clouds lifted somewhat as we climbed Furka Pass (2431 m, 7975 f) stopping at the Rhone Glacier and the historic Belvedere Hotel for the obligatory photo. The old stone hotel was closed [it has reopened]. We hustled to the summit where we were greeted by a break in the weather and an opportunity to take a photo of Grimsel Pass obscured in clouds. Last September I stood in the same spot wearing a short-sleeve jersey. 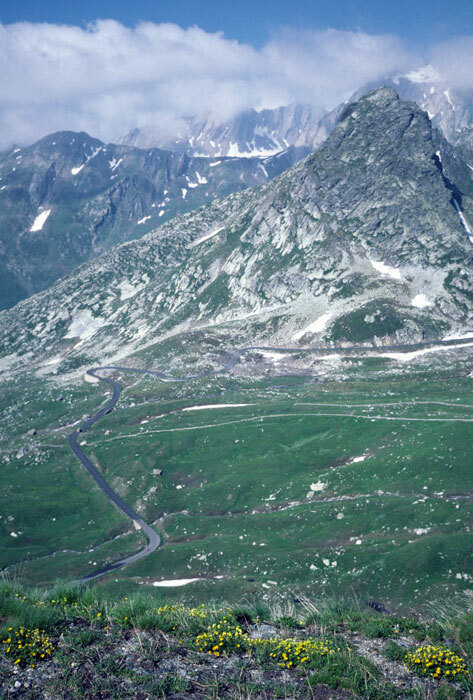 Grimsel Pass from Furka Pass. We left under cloudy skies heading toward Italy via the St. Gotthard Pass (2108 m, 6915 f), but at least the road was dry. The wide road on a 9 percent grade had little traffic at this early hour on a weekday. Midway up the pass we came upon a huge concrete air chamber shaped like a mushroom poking out of the ground. 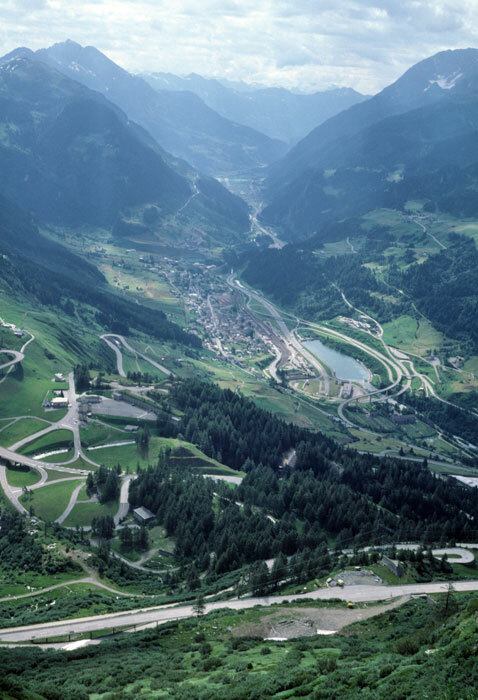 It provides air for the Gotthard tunnel extending 17 kilometers between Goschenen and Airolo. St. Gotthard Pass view toward Italy. We briefly stopped at the summit, where there’s an old fortress, a monastery, and a couple of hotels. During the descent I marveled at the ancient Roman road (and the old car road) twisting down the mountain. Our fast pace swept us downhill within minutes. We stopped for yet another obligatory photo at the section of road supported by concrete beams looming over Bedretto Valley. Given the right cropping, the road appears to be suspended in mid-air, the village of Fontana 1000 feet below. Obsessed with taking the perfect photo, Jobst hacked away at, limb for limb, a sapling growing next to the road. We rode through Ariolo and on down into the Levintina Valley where the Ticino River flows into Lake Maggiore. Hazy skies greeted us as we leveled out and passed factories and public works projects for the next 52 kilometers. We stopped to take photos at Biasca, where two waterfalls crisscross in spectacular fashion. In Bellinzona (229 m, 751 f) we had lunch at Fillipini’s, which Jobst knew for its granite columns supporting grape vines. Lake Lugano with palm trees. South of Bellinzona we climbed in sunny, warm weather the lowly Monte Ceneri Pass (554 m, 1817 f), which took the old main road to Cadenazzo. We reached Lugano, one of the southernmost cities in Switzerland, in mid-afternoon. 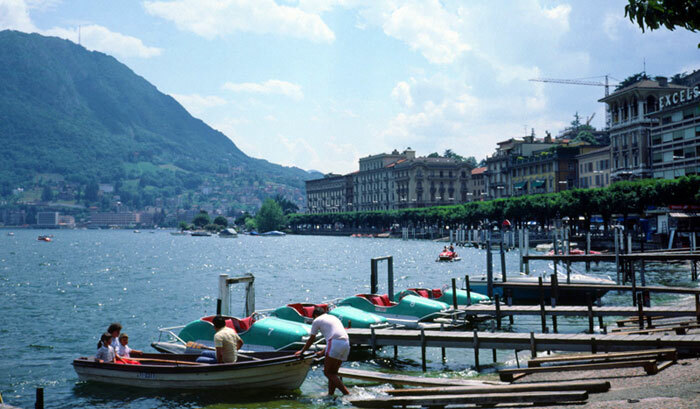 Lake Lugano gives the city its Mediterranean charm. Tourists strolled along the lake under the shade of trees, passing small boats beached on the smooth shoreline. Of course, in Melide we had to stop at “Little Switzerland,” a miniature-golf setting of Swiss towns, to take a photo of this unique tourist attraction. After buying some postcards next to the lake, we headed south toward Como. Crossing the border into Italy at Chiasso, we noticed a distinct increase in traffic the closer we got to Como, a popular tourist destination. The restored downtown has many quaint shops, a grand town square, and beautiful churches. 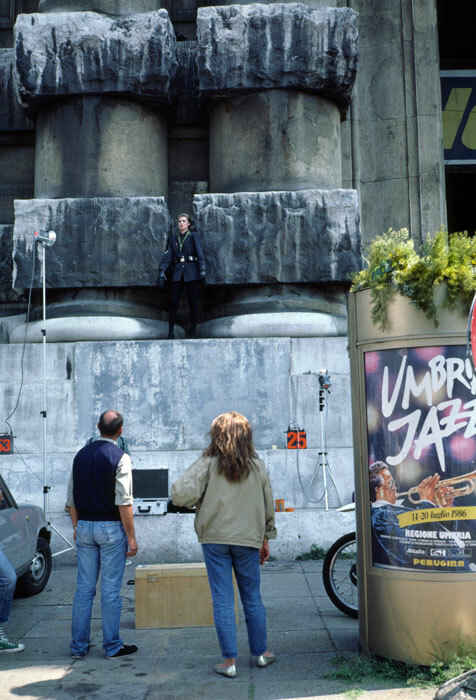 Photo shoot in Milan, Italy. We left for Milan at 8 a.m. Traffic, bad the day before around Como, reminded me of a bumper car amusement ride, as Fiats maneuvered for position on the pink granite paving stones. Downtown Milan became a parking lot as Jobst and I jockeyed for position weaving between cars and using sidewalks to outflank traffic. Our destination was the Cinelli factory in the eastern part of the city. However, Via Porpora was closed at a tunnel under a railroad near Central Station, so we had to ask for a way around. We stopped to see the train station where a model posed for photos between two massive columns. Eventually we found Cinelli’s small shop at 10 a.m. in an industrial area, but he wasn’t there. 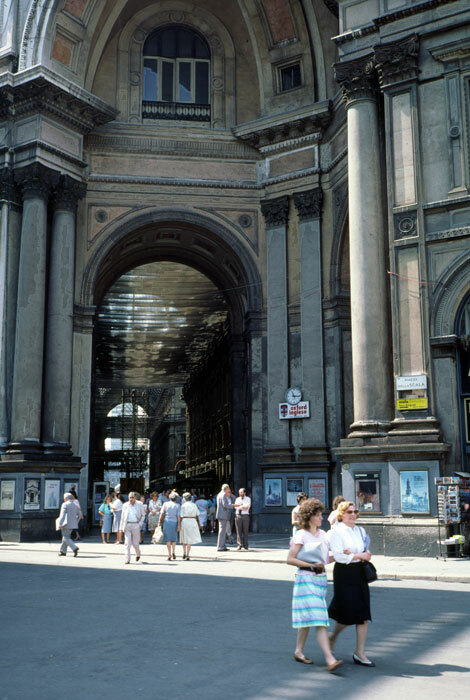 After looking around we headed west through Milan, stopping to see the Galleria covered mall with its distinctive arched entryway. We couldn’t resist going by to see the Vigorelli track to look for Masi, whose office is located below the stands He wasn’t in either, but Jobst raced on the wooden track. After lunch, we took up the long, flat ride across the Po Valley, destination the French Alps. It’s an all-day ride to reach Turin. Our route took us through Abbiategrasso, Vigevano, Mortara, Casale, and finally to Chivasso, where we called it a day. 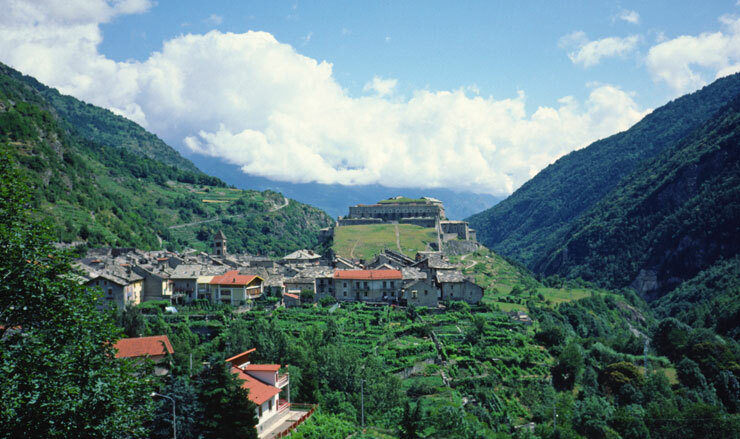 The valley supplies Italy much of its rice, soybeans, and corn. The valley is punctuated by the occasional grove of poplars used as wind-breaks, as well as isolated factories, many abandoned or half-completed. Lorry drivers buzzed within inches, but because the driver sits on the right and the roads are narrow, I knew the buzz was not meant to intimidate, as so often happens back home. In the hazy air, church steeples marked the next town on the march to Turin. 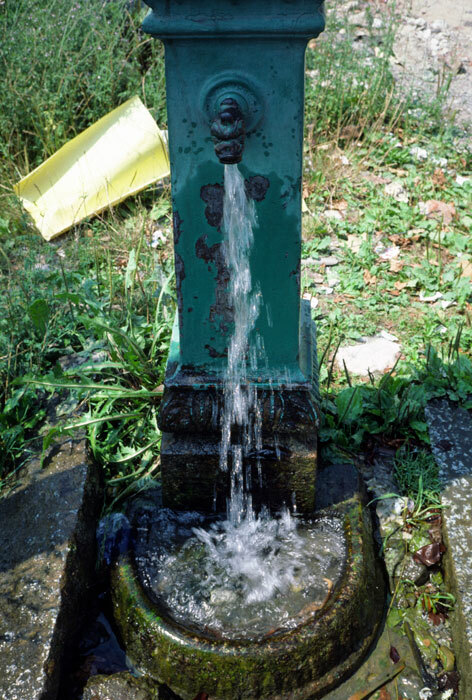 In each town we appreciated the water from the town square fountain. We had to get the owner out of bed for our 8 a.m. departure, a spry fellow with a neatly trimmed mustache. 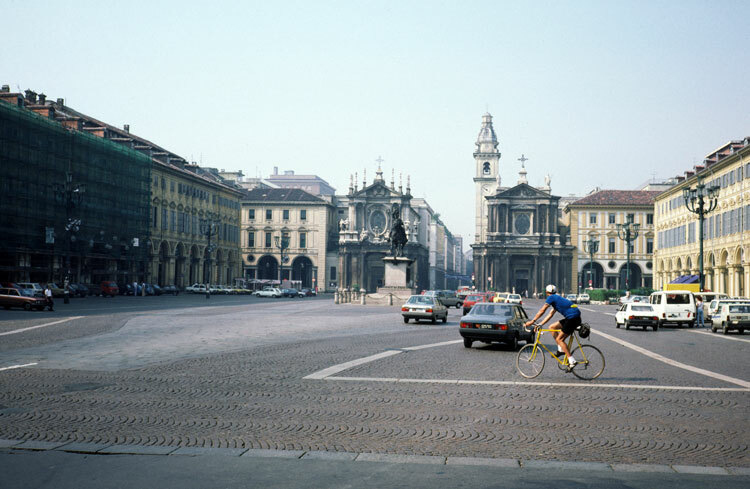 We reached Turin at 9 a.m. and rode to the spacious town square with its granite-slab streets, ignoring signs that said no bikes allowed. I’ve never seen such a large building frontage. 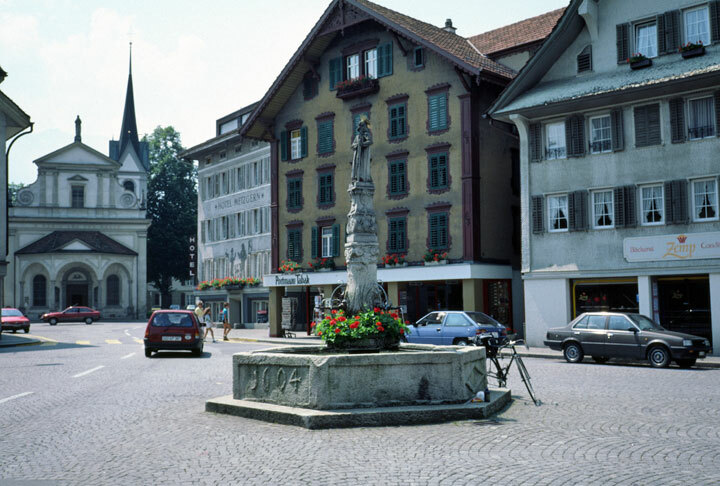 A single, multi-story building, probably housing, extended for many blocks, forming a square around the city center. We rode around some more, visiting a high tower and the old Fiat factory, with a test track on the roof. The nearby car museum was closed. We stopped to buy fruit at the outdoor market. Prices are negotiable. Although it didn’t keep me from riding, my right knee was bothering me. The pain later shifted to my left Achilles. We continued to Cuneo across the hot valley, passing through Carignano, Casalgrasso, Racconigi, Savigliano, and Centallo. At one stop for ice cream, Jobst dozed off for 15 minutes. Those would prove to be a 15 fateful minutes. Near Cuneo we finally saw the Alps. Crossing the high stone-arch road and rail viaduct over the Stura di Demonte into Cuneo is an unforgettable experience. 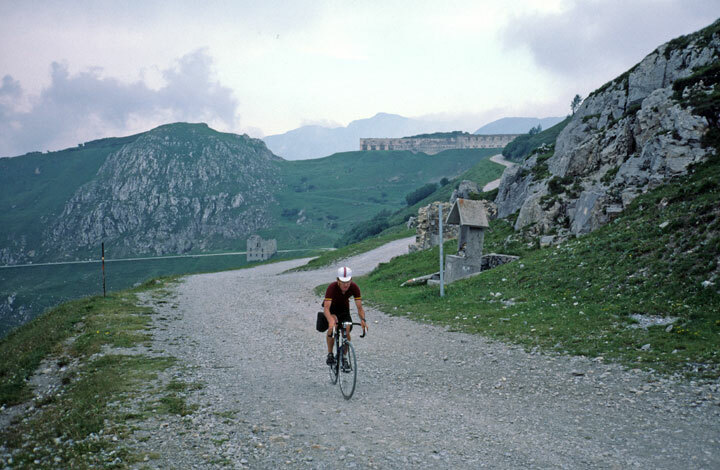 Outside Vernante I broke a rear spoke – darn those 6 speed rear wheels – on the approach to Tende Pass (1908 m, 6260 f). Jobst flatted a second time outside Milan, but neither mechanical difficulty slowed us down more than a few minutes. 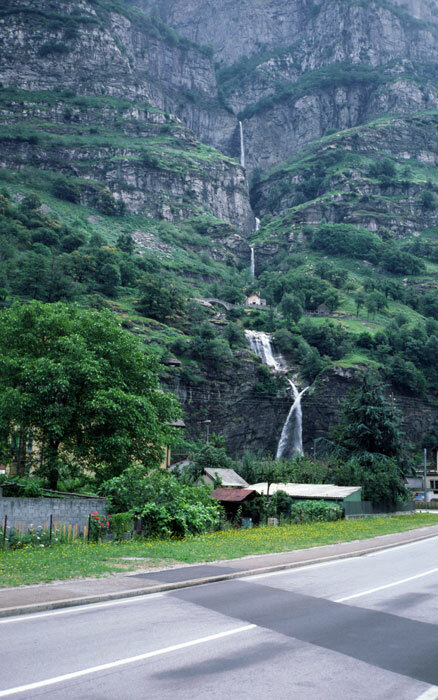 We climbed past Limone on Rt N20, a tree-lined two-lane road to the entrance of the 3180m long Tenda tunnel, the railway having headed into the mountain at Limone. Here we stopped at the small tourist information office and store before heading up the old summit road that climbs through a ski resort. At the summit the road turned to loose stone and we were presented with a vista of Biblical beauty. To our left huge stone fortresses stood silent overlooking the pass, monuments to another century. We looked with awe at the road snaking its way down the mountain in more than 100 hairpin turns. 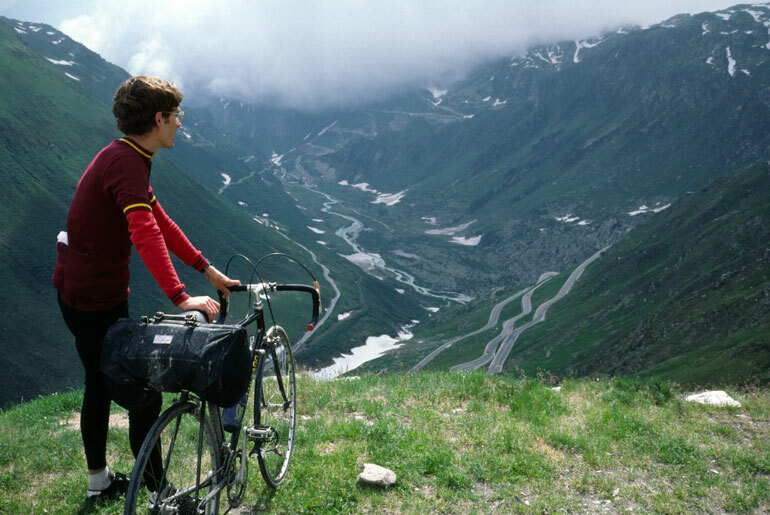 This was Jobst’s first time on the Tende Pass. A border patrol jeep made its way slowly up the pass. Col de Tende west, dirt. As we soaked in the scene, billowing white and gray thunderheads boiled up from the south. Lightning andthunder crashed around us, an auspicious beginning for our tour of the Provence. It could start raining any minute. No doubt this area sees many such storms around 5:30 p.m., our hour of arrival. We made our way gingerly down the rocky road. I stopped to walk around many of the hairpins. Jobst rode all the way. By the time I reached pavement at 6:30 p.m., rain was falling. Rivers of foam rolled off the rain-slick road, a sure sign of oil. I rode downhill with extra caution. 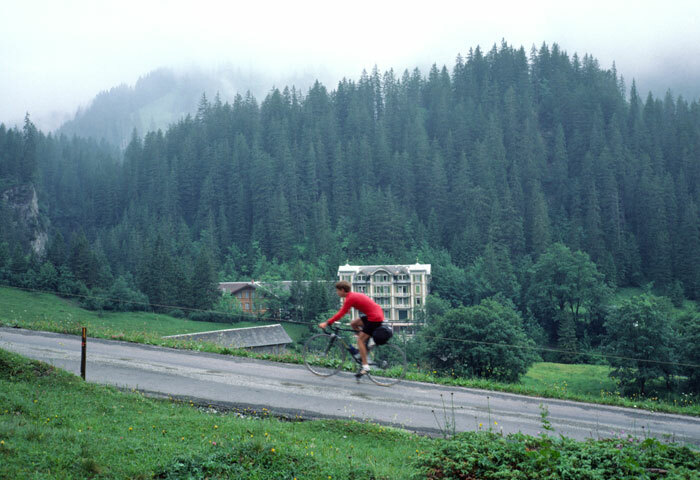 On a sweeping right-hand turn I saw Jobst lying on the ground, legs still attached to the pedals. He was slowly trying to get up. A man in a car coming down the road got out and tried to help. He offered a ride into town, minus the bike, so Jobst turned him down. Blood coated the right side of Jobst’s head where he fell, although it was just a scratch. Jobst got up and righted his undamaged bike. But when he tried to put weight on his right leg, he immediately knew it was broken [at the hip]. He decided he would try riding downhill to the first town to find a doctor. I had to lift his broken hip over the tall frame. 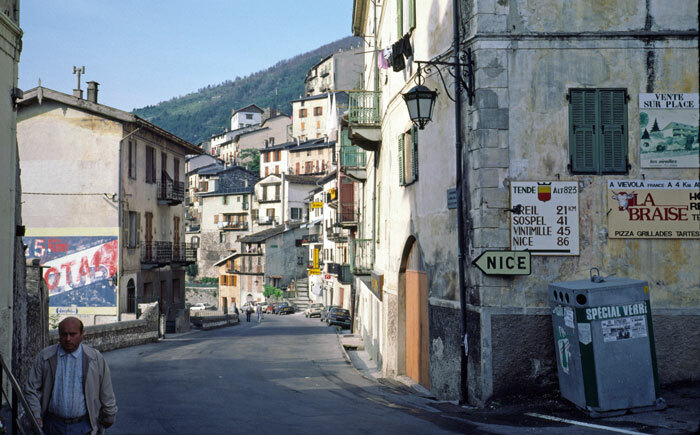 Jobst, who was shivering, coasted downhill in the rain to Vievola. Unfortunately, there wasn’t a doctor here, or a hotel available, so we coasted another three miles to Tende, a small town that did have a doctor’s office. We asked for a room, but the lady manager refused to let the bikes inside. She told us where to find the doctor’s office. Just as we arrived, Dr. Cocco emerged from his car. He scurried inside without saying a word. In a scene that was both comical and tragic, Jobst began crawling up the stairs (no handrail) to reach the doctor’s office. Once inside, Jobst met a man named Hans who spoke German and French. Neither of us spoke French, and the doctor spoke only French. Through Hans we explained what happened. X-rays confirmed the break, so Jobst had to be sent by ambulance to a hospital in Menton on the French Riviera (not a bad place to stay under the circumstances). I left at 8 a.m. after buying some pastry. Fortunately they took Lira. The ride took me downhill through a narrow canyon with the Roya River alongside. A rail line passed through the canyon as well, many tunnels cutting though the rocky hillside. In Ventimiglia at the coast an enormous parking lot filled with trucks greeted me as I crossed the Roya and climbed along the coast to the French Riviera. The glorious scene was obscured by a thick haze on this muggy, hot day. 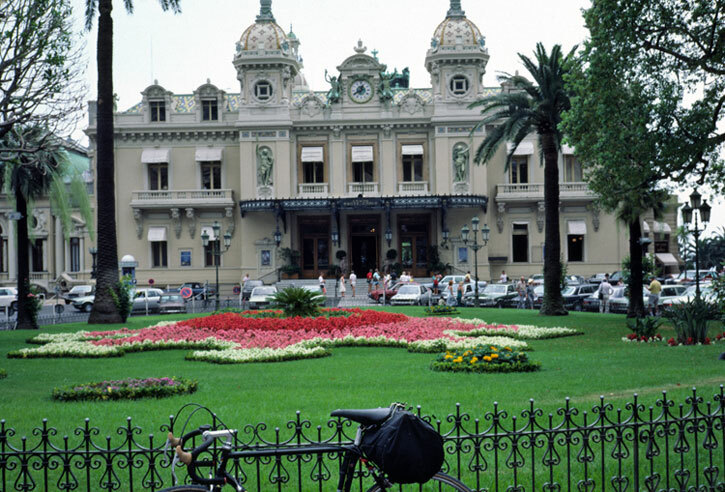 Monte Carlo casino in Nice. It took me a while to find Jobst in the hospital. When I found him he appeared to be in good spirits. He would require a pin in his leg, and the surgery would be done by an accomplished surgeon at a larger hospital in Nice. One of Jobst’s nephews, who was vacationing nearby, arranged for the transfer. I said good-bye shortly before noon. I ate lunch in a park next to the famous Monte Carlo gambling casino, and then rode southwest to Nice. From Nice I rode north on an expressway following the Var River Valley. After the traffic finally died down I decided to take a right at a turnoff, which leads to Valberg Pass through a narrow canyon called Gorges du Cians. 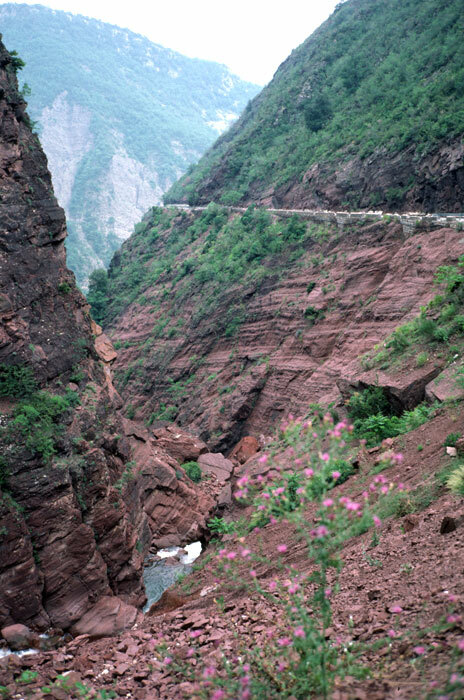 The gorge cut through red stone, with the road clinging to canyon walls. 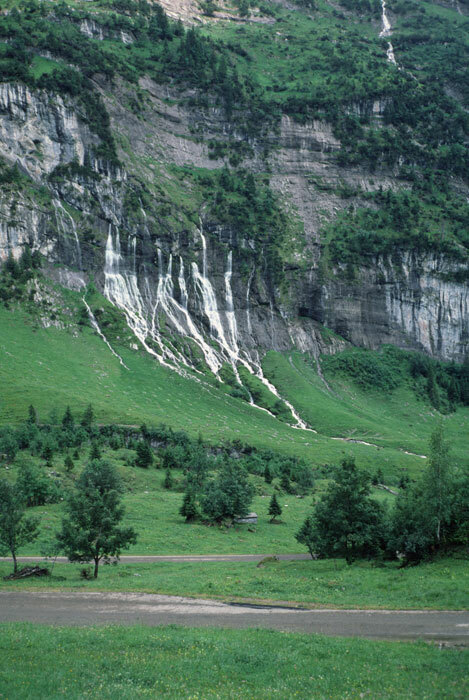 In some sections the road cut into solid rock, overhangs dripping water onto the road. Fortunately, there was no traffic, because the road was barely wider than a single lane in some sections. Following a good night’s sleep, I got up and soaked my aching Achilles. I started the day climbing Valberg Pass (1829 m, 6000 f), a 10 percent grade. On this sunny, warm day I reached the summit to be greeted with a cinematic view of the French Alps in all their glory. To top it off, I had a long descent on a 10 percent grade to Guillaumes (890 m, 2919 f) and the Var River. I headed north for the La Cayolle Pass (2326 m, 7631 f). Riding along a river canyon that reminded me of the Colorado Rockies, I couldn’t have asked for nicer weather or less traffic. I stopped at a house below St. Martin d’E, whose owners were outside renovating a chalet, to inquire about a pharmacy. The woman spoke English and offered me a pain killer, which worked wonders for my Achilles. Leaving town, I rode over a newly graveled section and immediately flatted. After a quick repair I was on my way through the long canyon. 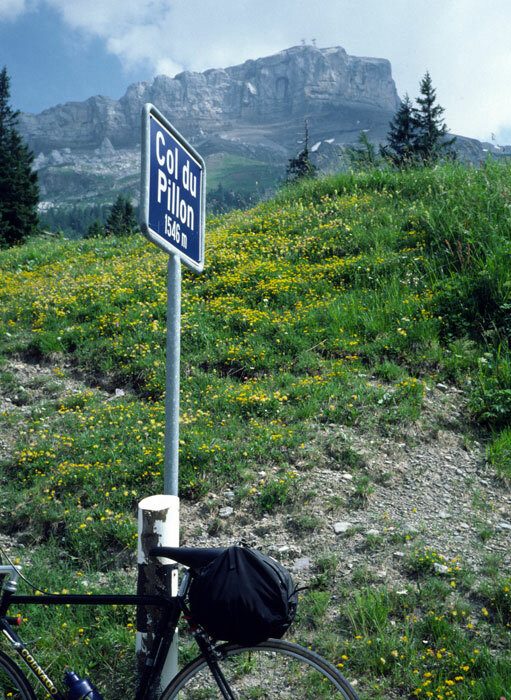 Finally, upon reaching the base of Cayolle Pass, I saw a lot of cyclists coming downhill. The road jerked up as the real climbing began, averaging 11 percent for long stretches. 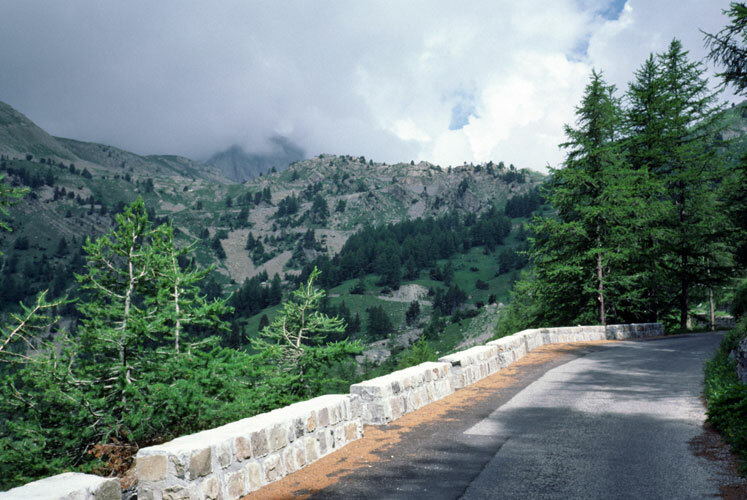 A low granite wall lined the road, one of the world’s most elegant guard rails. Below the gray granite peaks, green hillsides displayed delicate blue and yellow wildflowers. From sunny and warm, the weather quickly turned cloudy and cool as I approached the summit, a windswept place free from any ski development, as the summit borders Mercantour National Park. I ate a sandwich and put on warm clothes for the descent on an incredibly narrow road. A French cyclist took my photo. It sprinkled on the way down, but the road didn’t get wet. I stopped in Barcelonnette (1132 m) for pastry and continued on to climb my third pass of the day, Col de Vars (2109 m, 6919 f). The climb was only 10 kilometers, but steep. The weather warmed up again. At the summit I saw a car rally, mostly older sports cars like BMWs. Car rally on Col de Vars. The descent had several flat spots and then some steep sections farther down, with ski chalets along the way. I stopped to take a photo of the town of Guillestre on the flat valley floor, surrounded by mountains. In town I saw a fishing contest taking place in the fountain of the main square. While the townspeople were fishing, I landed a warm loaf of bread straight from the oven. 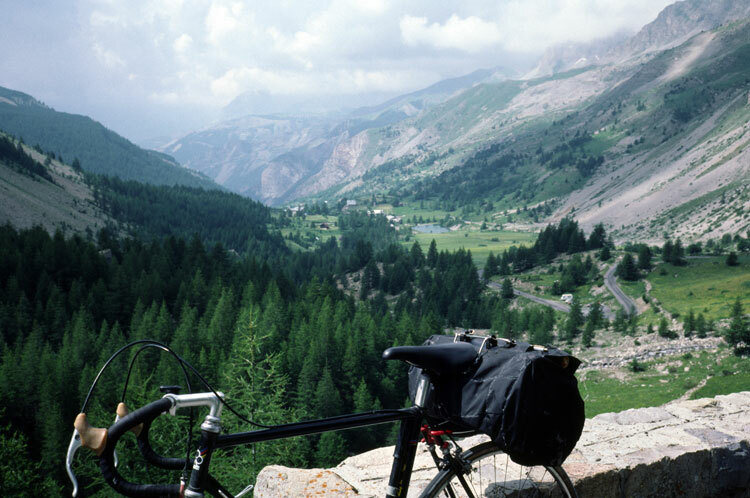 I rode up the valley following the Guil River, another reminder of my bike rides in the Colorado Rockies. 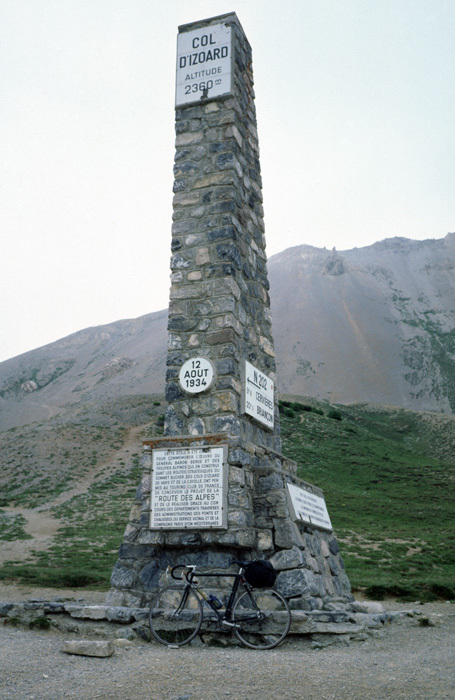 I decided to end my ride in the town of Arvieux at the base of Izoard Pass. I got away at 8 a.m., my earliest departure. It was cloudy, but warm. I felt comfortable in a short-sleeve jersey. 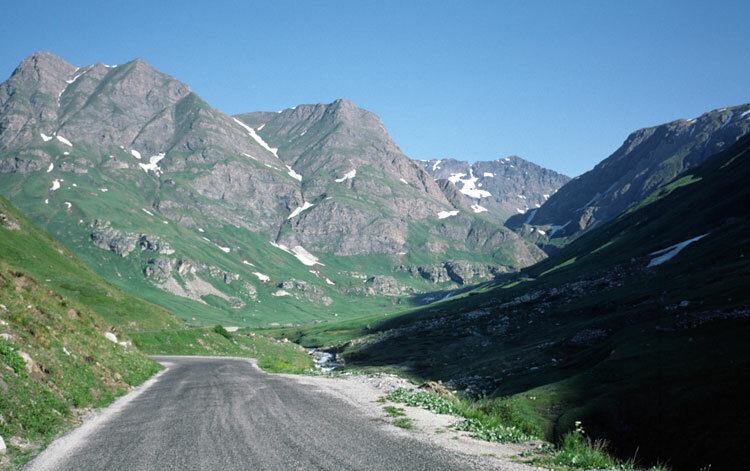 The climb up Izoard Pass, 12 percent grade or steeper, (2360 m, 7743 f) went on for about 10 kilometers. Most of the climb was near tree line, as I took in the view of France’s high peaks, including Rochebrune at 3324 meters not far from the Italian border. With little, if any, traffic I had a chance to enjoy the rugged beauty of the Alps, where granite scree slopes mix with patches of grass and stunted conifers. Everywhere I looked in the distance, I saw breath-taking views of mountain ranges. 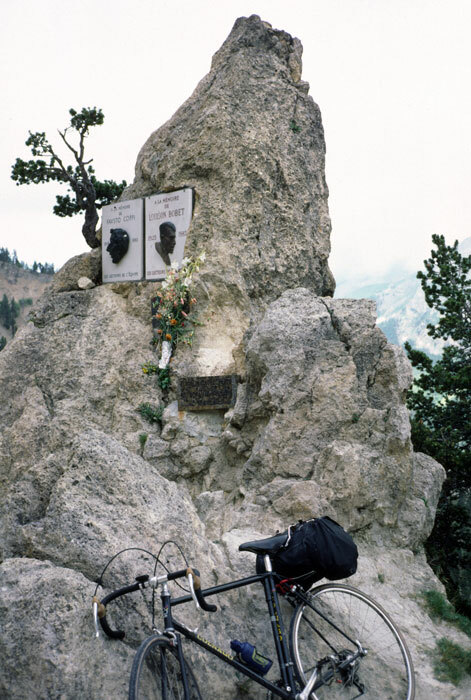 Near the summit I came upon the famed plaque with bronzed heads dedicated to bike racers Fausto Coppi, of Italy, and Louis Bobet of France. Their racing took place decades ago on dirt roads over the same passes I traversed, but now smoothly paved. 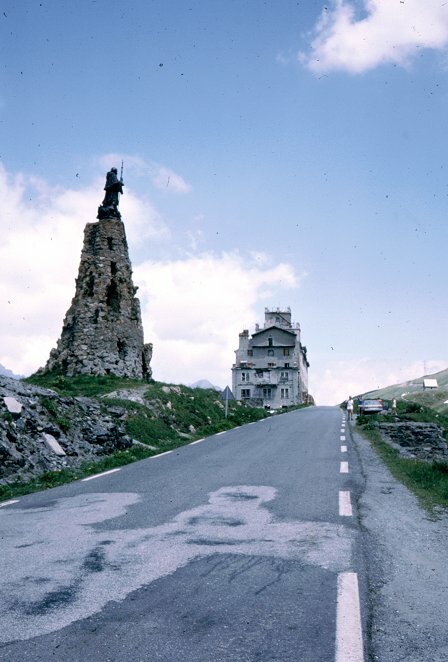 On the 23 kilometer descent to Briancon I saw an old fort, reminding me that Napoleon, on one of his military campaigns, marched his army over the same passes I had taken. 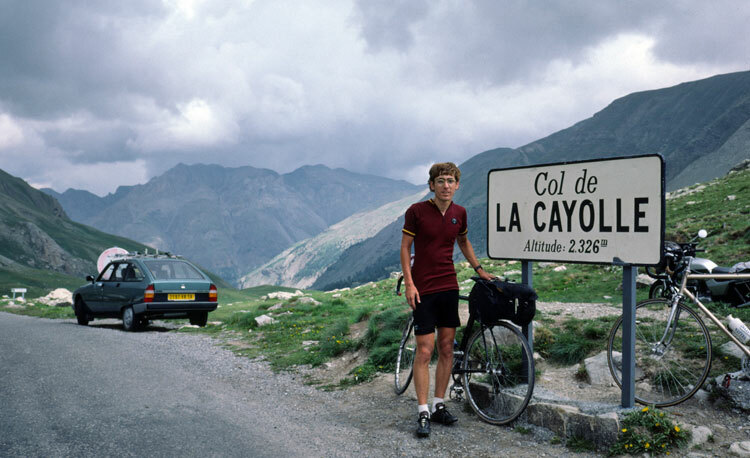 As I expected, the weather was not cooperating for a ride up the Galibier. It was cool, cloudy, and breezy. I decided to head to sunny Italy instead. I charged up Montgenevre Pass (1850 m, 6069 f) to the border and a ski resort. Historians speculate this was the pass used by Hannibal in his invasion of Italy. The descent to Cesana, where I turned north, took me through two long tunnels at high speed. I passed through several more tunnels before reaching Oulx in the valley. Major road building was going on here to make way for a freeway. I passed through another tunnel to be greeted by a castle fortress and the ancient village of Exilles with its stone buildings and roofs of slate. I stopped in the village to appreciate this historic place where time stood still. Clothing hung from windows, drying in the warm summer air. All was quiet on the narrow streets. The usually muggy Italian air had cleared out after the evening rain to reveal a beautiful valley. I stopped in Chiomonte for lunch at a new store, before continuing to Susa where I headed up Mt. Cenis Pass (2083 m, 6833 f) and France. I had the road to myself as I climbed on a 10 percent grade through a dense deciduous forest, with views of Italy and the French alps to pass the time. The weather had turned warm, another great day for riding in the Alps. At the French border I stopped at a store for my favorite drink, an Orangina. I could see a hydroelectric project above as the road continued up a series of hairpins. The road peaked at Cenis reservoir, following the shore of the large lake. 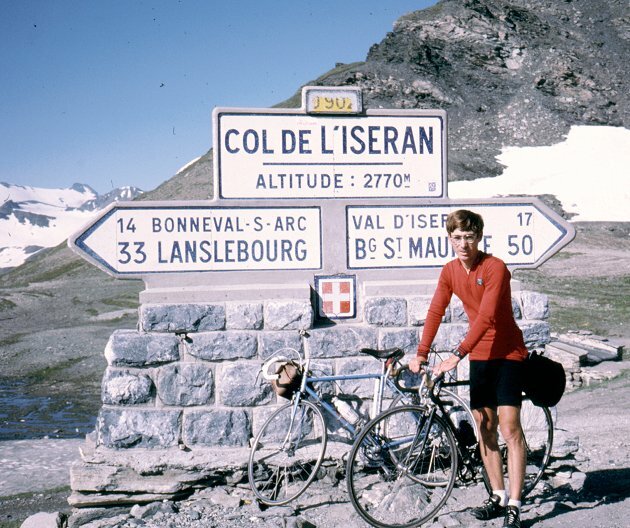 I sped down to Lansiebourg on an 11 percent grade, staging point for L’Iseran Pass. 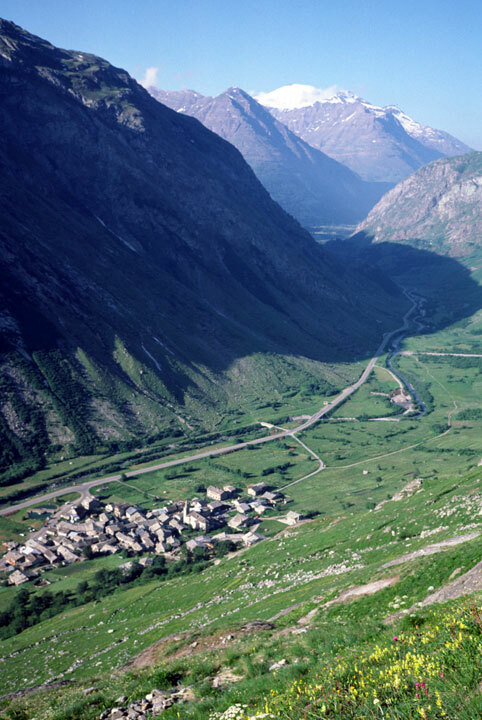 The valley to L’Iseran Pass along the Arc River offered unforgettable views of Alpine peaks. To my left was the unspoiled Vanoise National Park with prominent peaks Grand Casse (3852 m) and Roc Nois (3584). I arrived at the village of Bonneval S. Arc at the base of the pass at 4:45 p.m. and decided to find a room for the night. I located Hotel du Glacier Des Evettes, a one-star hotel, and would not be disappointed. By the time I sat down to dinner, the weather had turned cloudy and cold. From my dining area I could see outside an enormous plate glass window the Massif de la Voise. If the view weren’t enough I enjoyed fine French cuisine: steak, potatoes, warm bread, vegetables in a delectable sauce, capped with ice cream. I downed my usual 16 ounce beer contemplating the day’s ride and the miles ahead. (144 km, 89 miles). I started at 8 a.m. after the usual breakfast of bread, butter, jam, and tea, paying 207 franks for the stay. It was another glorious day in the Alps, and a good thing because the I’Iseran Pass (2770 m, 9094 f) has no shelter, not even a tree for protection from the elements. The climb was one of the most difficult I experienced in the Alps, but doesn’t compare to Sonora Pass in California, which has a long stretch of 16-18 percent, for those of you who need a challenge. 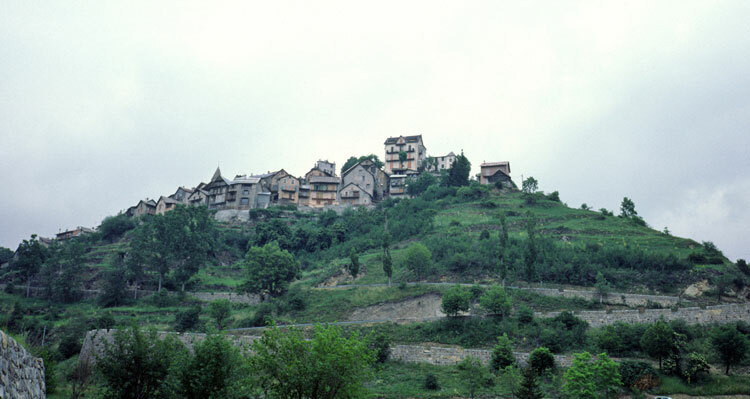 L’Iseran was between 11 and 12 percent in most places. Approaching the summit, I saw summer skiers gliding down glaciers. After 1:45 of climbing I reached the summit, where I met a French rider who took my photo. He had a French Roold bike, the same bike I owned in the early 1970s. I saw dozens of riders coming up the pass in brilliant sunshine and warm temperatures. Far below I saw the Tignes les Boisses ski resort in the valley. 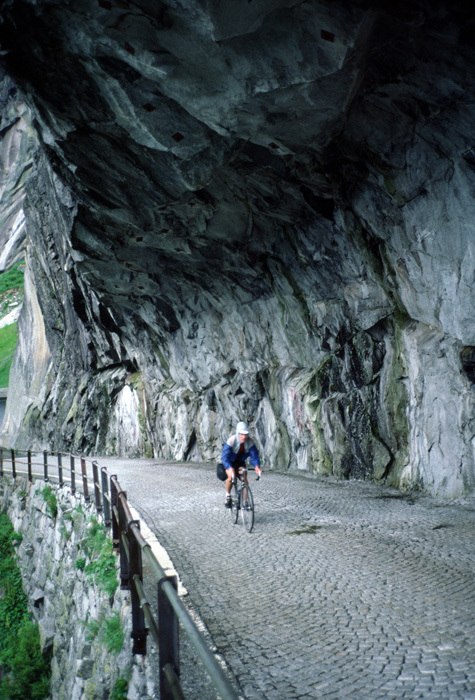 I passed through several long tunnels bordering a reservoir on the long descent to Seez. Exilles, Italy, with ancient slate roofs. I stopped for lunch of bread, sardines, grape juice and two candy bars, fuel that would help me blast my way to the Petit St. Bernardo summit (2188 m, 7178 f) at 10 mph or more. The narrow road took me past a statue of the St. Bernard priest himself and two old hotels that looked as if they had been shelled, maybe in WWII. 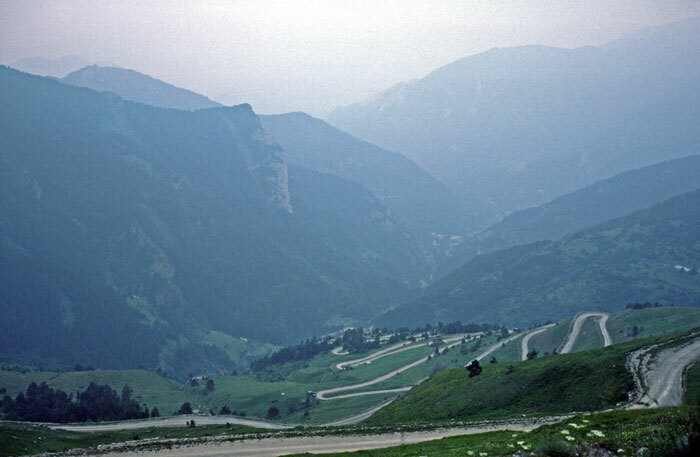 I said good-bye to France and hello to Italy as I descended the windy road to the Dora di la Thuile River valley. I stopped for ice cream a store near an orchard and then continued on to Aosta (583 m) following the Dora Baltea River. I had to wait for the hotel owner to get up, with final departure at 8:30 a.m. after Coke and pastry. No sooner was I out the door when I saw a rider emerge from nowhere with a musette bag over his shoulder. We struck up a conversation. 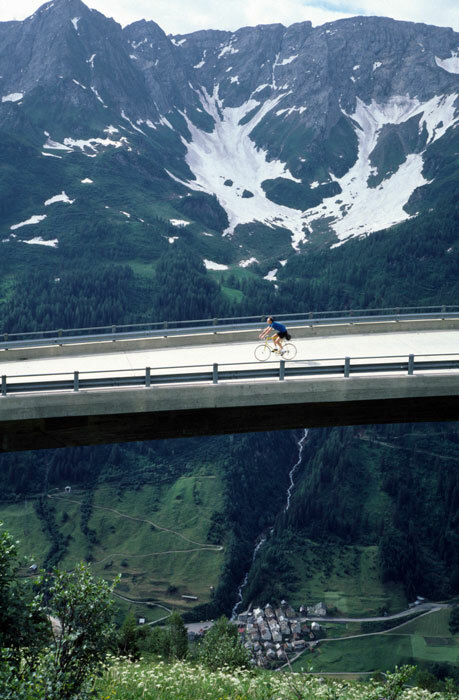 He was a 44-year-old Belgian, riding up this pass for the first time on his Alan aluminum frame. After 30 minutes we joined up with the same three Swiss riders I ran into the previous day, and rode together for a while. 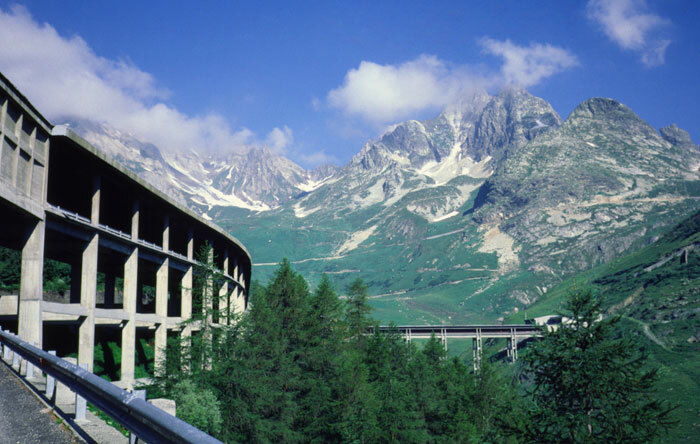 The Gran St. Bernardo Pass (2469 m, 8100 f) climbs at a steady 9 percent, the massive concrete roadway leading to the car tunnel clearly visible far above. Wildflowers bloomed in profusion on the hillside, with the snow-covered Alps as a backdrop. Petit St. Bernard Pass summit. We reached the summit after 12 miles of climbing, where there’s a glacial lake, a monastery, and a huge hotel. My Belgian friend borrowed a tool to fix his front derailleur, we took our photos, and said good-bye. As I passed the border into Switzerland, a border guard told me to stop. He said I needed a light to get through the tunnel, but I argued the tunnel is open so I didn’t need one. He let me continue. I sped through the open tunnel at 30 mph keeping pace with cars. When I emerged, I was greeted by more beautiful scenery and brilliant sunshine. I stopped for lunch at Les Valettes. 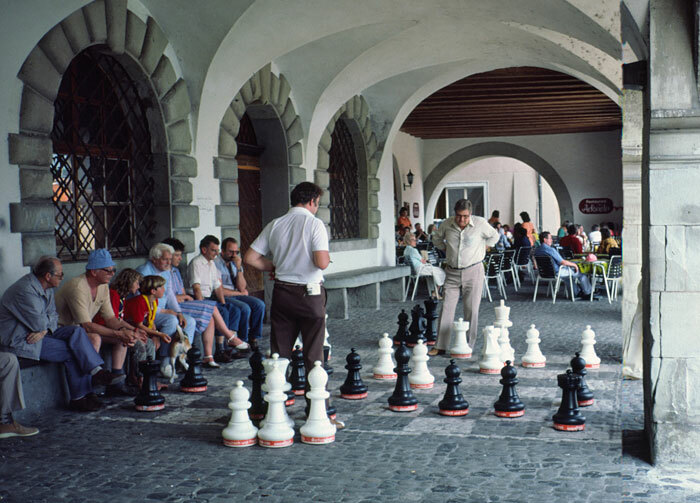 Martigny is only a few miles farther, a nice town with a long plaza. Grand St. Bernard Pass highway. I decided to continue north following the Rhone River Valley, passing Bex and Aigle (417 m) before turning right for Pillon Pass (1546 m, 5072 f). Farmland and vineyards cover the wide, flat valley marked by a northerly headwind. The weather was hot and muggy as I passed vineyards on my way to the summit. The climb started with a 9 percent grade and ended at 12 percent near the summit, where I saw a small glacier in the distance. I was truly in the heart of Switzerland, riding through some of the most beautiful countryside on earth: Every cottage immaculately maintained, showing off flower boxes at every window. There wasn’t a piece of trash on the roadside. Cherry trees laden with fruit complemented green fields with blooming flowers. 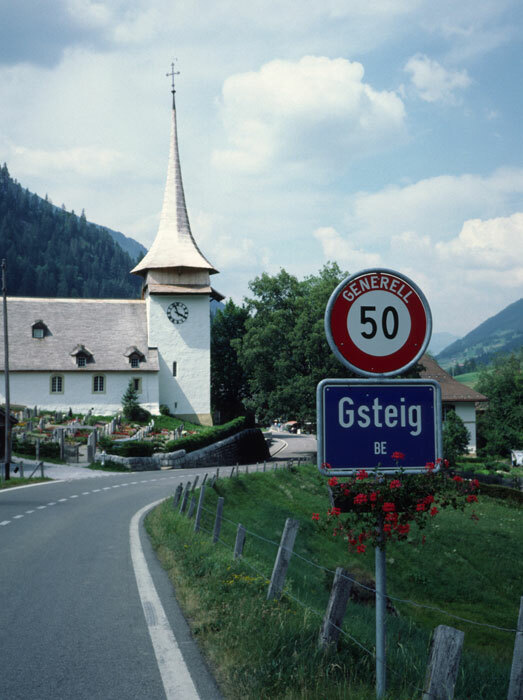 The town of Gsteig is a picture postcard of what people imagine of Switzerland, with its white steeple church and Swiss style cottages with flower pots lining every window. In another 10 kilometers I arrived in the swank, touristy Gstaad where, I’m told, movie stars like to stay. I stopped for a bite to eat and continued to Sarnen, where hang gliders soared in the afternoon sky. I went right and climbed a short pass (1279 m), calling it a day at Zweisimmen. I found a room on the third try at the Krone Hotel. 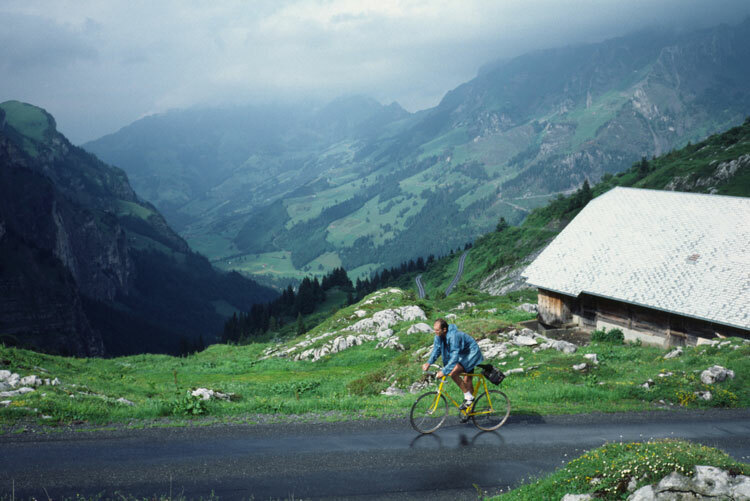 I left at 8 a.m., riding the Simmental downhill to Spiez on the Thunersee and along the lake to Interlaken. By 9:45 I was sitting on a bench at the meadow in the middle of town with a view of the glistening-white Jungfrau visible through the morning haze. By noon I had reached Sarnen after riding over the Brunig Pass (1008 m, 3307 f). I had forgotten a lot of details about the climb, like the town at the summit and the base of the hill. I ate lunch at my favorite town with its fountain, magazine rack, and bakery. In the morning it was raining steadily, but at this point it didn’t matter because my ride was only 20 miles to Affoltern. I met the Dierauers that morning and the next day took a train to the Zurich airport. (33 km, 20 miles) Total miles 1080, an average of 77 miles (124 km) per day. Fortunately Jobst recovered completely from his injury. 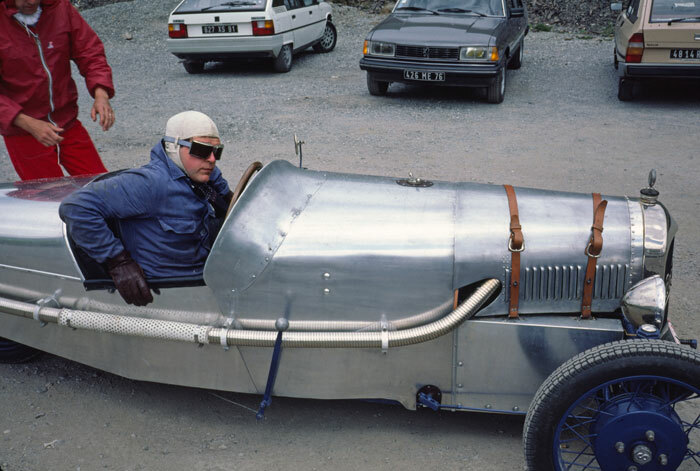 He limped around for about more than a year (including a ride through the Alps) before the metal hardware was removed from his leg in an operation at Stanford Hospital. The metal rod didn’t bother his bike riding. Jobst died on May 5, 2015, at the age of 80. This was my last bike trip to Europe, as I shifted my traveling days to Asia with tours of Thailand (some bike riding), Japan, and the Philippines (some bike riding).